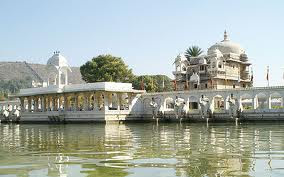 Here is Some Information about Jag Mandir Temple in Udaipur Rajasthan. Jag Mandir is built on an island in of of the four lakes of udaipur known as lake Pichola. 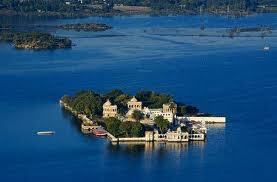 Jag Mandir is also known as “Lake Garden Palace”. 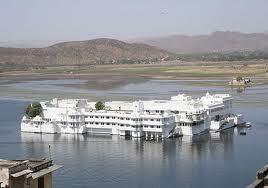 The place is located in lake Pichola, Udaipur, Rajasthan. 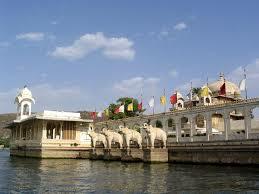 The construction of the place is credited to three persons, the Maharanas of Udaipur . The built started in the year of 1551 by the great Maharana Amar Singh, and the built was continued in 1620 by Maharana Karan Singh till the year of 1628. The completion of the task was done by Maharana Jagat Singh from year 1628 to the year 1652. Thus, the place took about 101 years to built. 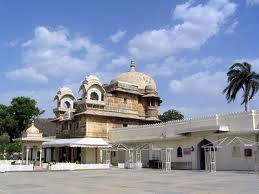 The name Jag Mandir is due to the last Maharana who completed the built of the place. It was a place for the Royal family to enjoy and party. Jag Mandir's history begins with the Maharana Karan Singh's benevolence shown to Emperor Shahjahan ( 1605-1627 ). Shahjahan, before he was crowned as Mughal Emperor, was known during his young days as Prince Khurram. As Khurram, he rebelled against his father Emperor Jahangir in 1623, because he wanted to be the heir to the Mughal throne. 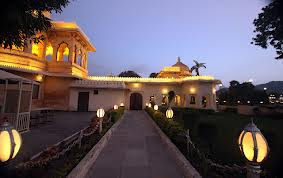 Faced with danger of getting thwarted in his campaign, he sought refuge in Mewar Kingdom at Udaipur where he was given safe haven by the then Maharana Karan Singh ( it is said that this courtesy was extended because Khurram's mother was a Rajput Hindu lady ). He was initially kept in the City Palace along with his wife Mumtaz Mahal and his two sons, Prince Dara and Prince Aurangzeb. 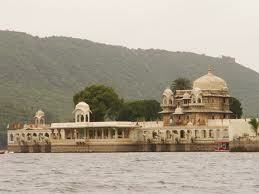 Later they were shifted to the Gul Mahal, as a safe refuge, in the midst of the lake ( this place since then has also been called Khurram's Palace ). Gul Mahal is a domed pavilion that was specially built for Khurram by Maharana Karan Singh. 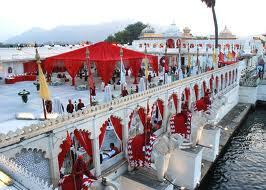 It was later enlarged by his son Jagat Singh into a huge palace and named as the Jag Mandir palace. Khurram remained under Mewar's protection during 1623-1624. The irony of this act of hospitality shown by Karan Singh to Khurram is that his father Maharana Amar Singh had been defeated in the war in 1614 by Khurram. Later, prince Karan Singh had acted as an envoy to the Mughal court, and cordial amity developed between the two rival kingdoms of Mewar and the Mughals. This relationship helped Khurram who was subsequently, in the year 1623, given refuge in Jag Mandir by Maharana Karana Singh. Following the death of Jahangir in 1627, Khurram ascended the throne of the Mughal Empire. 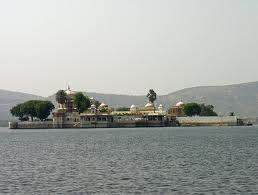 It is said that Khurram was bestowed the title of Shah Jahan at the Badal Mahal in Udaipur before he left Udaipur for his crowning as the Mughal emperor. By Air:Dabok airport, better known as Maharana Pratap Airport, is named after the famous Mewar leader in Udaipur. This airstrip is located 20 kms to the outskirts of the city. Several domestic airlines connect Udaipur to major cities of Delhi, Kolkata, Mumbai, Jaipur, and Jodhpur. The city has numerous air carriers like Jet Airways, Kingfisher Airlines and Indian Airlines flying daily to different cities. Tourists coming from abroad can get connecting flights from Delhi to Udaipur. 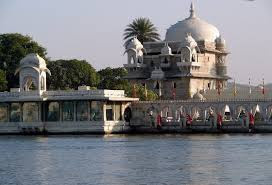 By Rail :Udaipur is well connected to cities of Mumbai, Delhi, Kolkata, Ajmer, Chittor and Ahmedabad by its broad gauge railway line. Several express and passenger trains ply regularly from Udaipur to the neighboring cities of Jaisalmer and Jaipur. The posh train 'Palace on the Wheels' makes a regular stopover in the city. For those wanting a dream tour of this fairyland, boarding on this royal ride would take you on an enchanting trip down this regal city. By Road :Udaipur is just a few hours' drive away from Gujarat, Madhya Pradesh, Delhi and Mumbai. 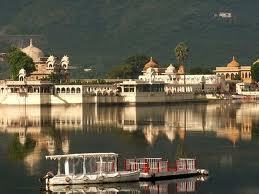 The best and fastest route to reach Udaipur is through NH 8 (national highway 8). Besides this, the Rajasthan Transport department also provides economical bus services from Udaipur to other important cities in the state. 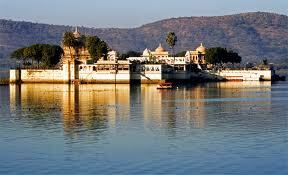 You can opt for AC coaches or super deluxe state buses to reach Udaipur. Alternately, you can also hire cabs to reach this beautiful city.